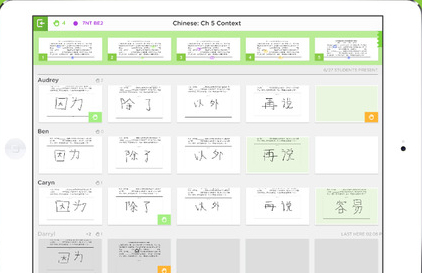 ClassKick is an iOS app that allows instructors to observe their students’ work as it is created. Instructors first create a class, which is assigned a unique code, and add their roster. 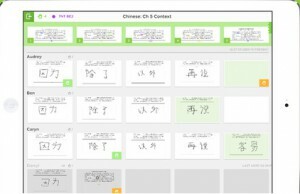 Then, the instructor can create questions by drawing or typing on the whiteboard or take screen shots of documents, worksheets, websites, or anything else displayed on their iPad screen. 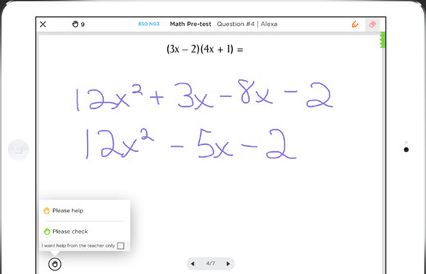 For example, an instructor could log into Google Drive on their iPad, open a copy of a quiz, and take a screen shot of a page that contains a “solve for X” equation. 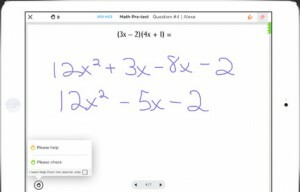 After the instructor gives students the class code, they have access to the page with the solve for X equation. Each student can then use the drawing tools to mark on the page, showing their work as they solve the equation. If a student is confused or has a question, he/she can raise a virtual hand. These hands appear on the teacher dashboard to show who needs help. As students work, the instructor can watch their progress, jumping in to draw attention to errors or answer questions. Students can also collaborate with one another. They don’t see their classmates’ names, however, so it’s not apparent who is struggling, only that someone could use help.